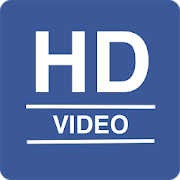 HD Video Downloader for Facebook - The top and the best video downloader app for Facebook on PlayStore. - Ability to send/share the downloaded videos with your friends in your circle through Whatsapp, bluetooth, Instagram, etc directly from the app. All graphical assets used in this app are directly sourced from icons8. - This app is not affiliated with or endorsed by the Facebook Inc.
- Any issues related to copyrights with regard to unauthorized downloads or for any matters related to intellectual property rights, please contact Facebook directly. This app merely acts as a platform for browsing Facebook through a well defined user friendly UI using android web view component.